Hey soul sister, ain't that mister, mister, on the radio, stereo...the way you move ain't fair you know...Hey soul sister, I don't wanna miss a single thing you doooo...tonight. I could go on but I won't. I absolutely cannot get that Train song out of my head and it doesn't help that every single time I get in the car, it's playing and if it's not I just switch the channel 4 or 5 times until it is. Then I leave it there and sing it at the top of my lungs. I am sure I will eventually grow tired of it, but right now it is stuck to my brain like white on rice....your lipstick stains, on the front lobe of my left-side brains... See what I mean? I said brain so there it just comes out. What the heck does that mean anyway?.. lipstick stains on the front lobe of my left-side brains? I have absolutely no clue but I am still obsessed, all the same. 1. Sunroom Furniture. I want some bad. The painter, who is supposed to paint that room Viridian Green and the living room Fudgecicle this week has still not called yet and he said he'd call the day before he comes. I'm thinking it ain't gonna happen this week and wondering when it will. 2. 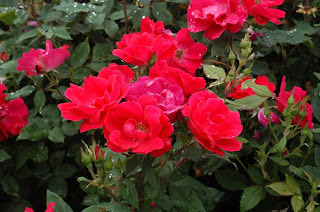 Knockout Roses. I can't stop thinking about knockout roses. There are some old scraggly looking shrubs that run along the brick wall beside the driveway and I want to replace them with my new found obsession, the knockout rose. I just bought two at Lowe's to plant on either side of the front steps and I want more, more, more. 3. Wondering why someone with a temperament issue would be allowed to coach little kids. I say this because the team Dracen's baseball team played yesterday had a coach who, if he'd talked to my child the way he was talking to the ones on his team, would have gotten a rare dose of me that is normally tucked quietly away. In other words, my Beotch would have come out of the box. Almost did anyway. I was shocked that a mother didn't come down off those bleachers and (as Charlie would say) tear through him like a chainsaw through a screen door. I'm just sayin'. Dude, it's LITTLE League not the World Series. 4. 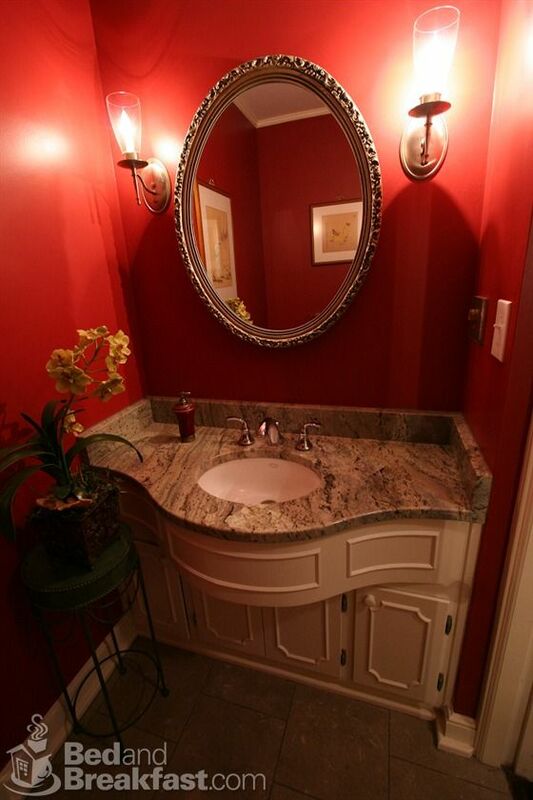 A red bathroom/laundry room. We looked at a house during our looong search for one that had a red half bath and ever since then, I have kinda wanted one. My laundry room/half bath here is right off the kitchen which I am doing in red accents so I already had the idea of stripping down that ivy wallpaper in there and painting it red. Then my stepsister , Steph, who faithfully reads and comments on my blog said that someone told her everyone should have a red bathroom in their house. 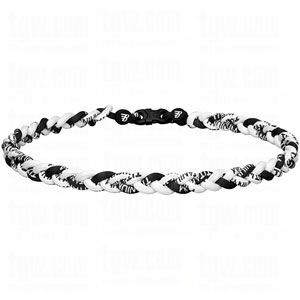 I'm gonna have one. And soon. 5. My metabolism. Where the heck did it go? 6. Bohemian style tops. I can't get enough of them. 7. Claw foot tubs. 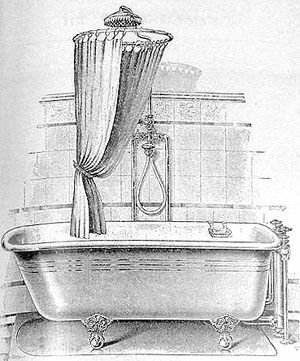 I am a bath person, always have been, and our master bath is plenty big enough but the people who lived here before, who built the house, were not bath people so there is only a shower in there. Eventually, hopefully in the not so distant future, we will have a bathroom makeover that will include my claw foot tub. 8. Flip flops. Just because. 9. Porches/porch rails. I love our new front porch and the columns that run across the front of it but right now we don't use it and I have forbidden the boys to go on it because it is way too high to not have any rails. No children ever lived here before. I am constantly scoping out every porch I drive by but so far I have not seen one with a combination of columns like ours and rails. See what I mean...Major liability here. 10. Wondering why it is that the Dracenator must always be the very last one out of the dugout at the end of his games. 11. And why Devin randomly shouts out "Soldier Boy! "...only he says, "Soldya Boy"! ?? And also why, since he was about 7, refuses to let me take his picture. I have to sneak up on him like a wildlife photographer. Shh...he has no idea I took this. 12. Trying to figure out what the big draw is to these titanium, ionic necklaces that all the baseball boys are wearing. Devin and the Dracenator are anxiously awaiting theirs that we ordered and they paid for with their own money. Some questions have no good answers. This is like trying to figure out why we wore tapered acid wash jeans and put friendship pins on our shoelaces. Don't ask why. 13. 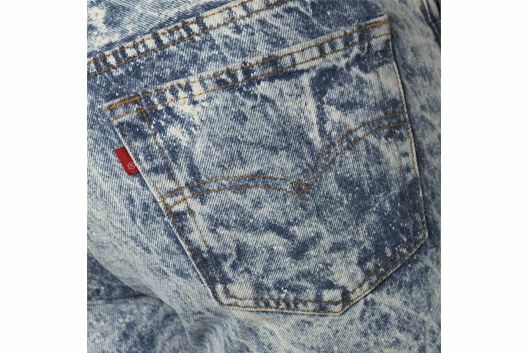 Speaking of acid wash jeans....are they trying to bring those atrocities back around? I was at the mall today and saw some denim that dangerously resembled acid wash. I stepped quickly away and did not look back, pass Go or collect my 200 dollars cause that is just flat out one era of my life I do not care to revisit. Can I get an AMEN from all my 80s Soul Sisters? I love your blog. It makes me feel connected to you. For instance, we went shopping today at a Pottery Barn Outlet store. As soon as we walked in there were some fun, fun outdoor pillows-- khaki with red poppies on them. They might would look good in your green sunroom. I loved them and thought you would, too. I also bought one of your fancy friday finds. I didn't even realize it until I got home. It was the kitchen letter box from TJ Maxx. Only mine is in a pale aqua blue because my kitchen is red.